This routine computes a set of basic sample statistics, such as read counts, number of clonotypes, etc. This routine computes Variable (V) and Joining (J) segment usage vectors, i.e. the frequency of associated reads for each of V/J segments present in sample(s). If plotting is on, will also perform clustering for V/J usage vectors and samples à la gene expression analysis. Images, having the same name as tables, with the exception of .pdf extension, are created if plotting is on. 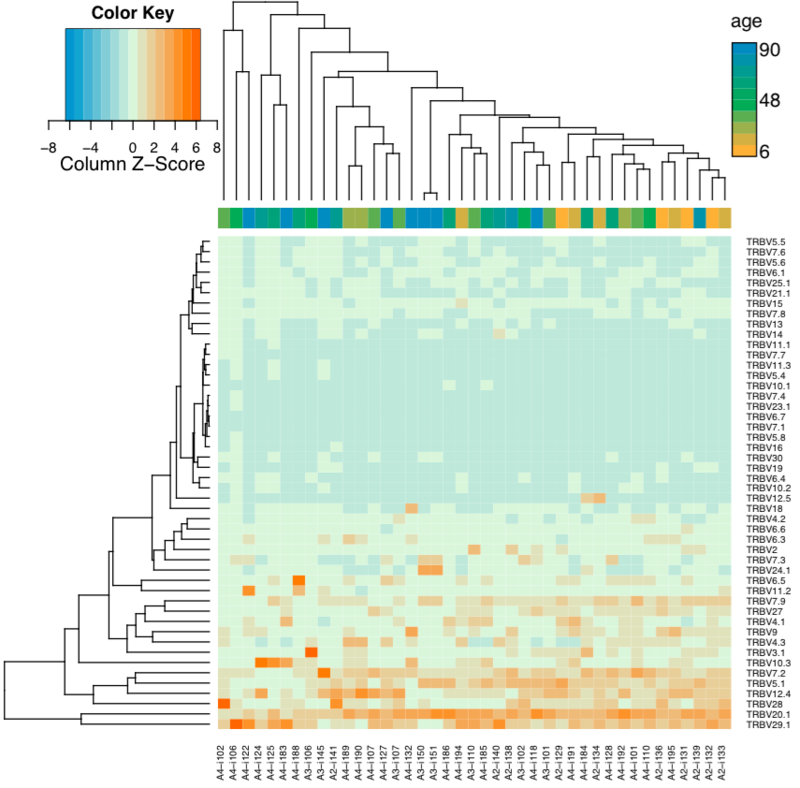 They display segment usage heatmap and hierarchical clustering for samples and segment. 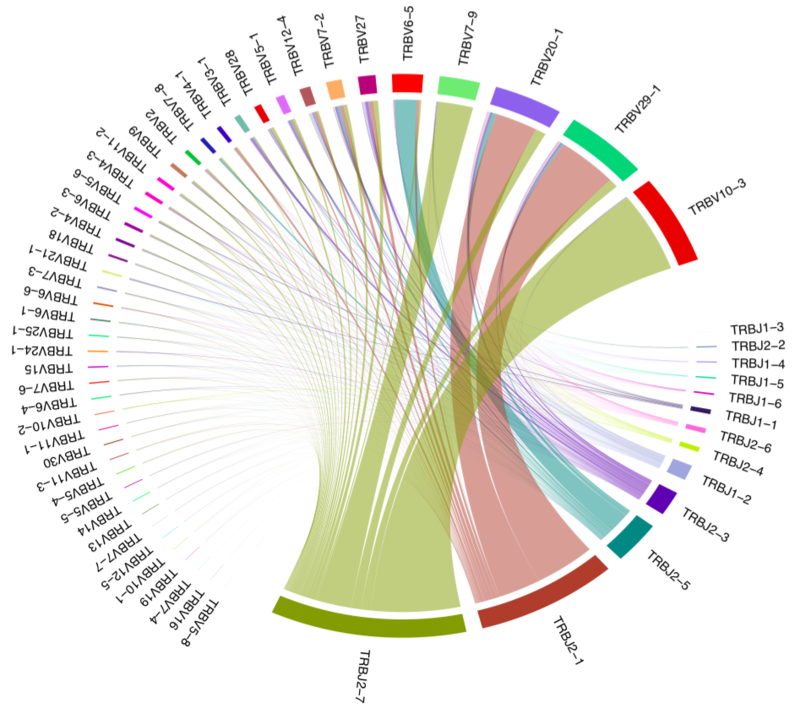 This figure will be created using heatmap.2 function from gplots R package with default clustering parameters. Sample clustering based on Variable segment usage. Weighted Variable usage profiles are used, hierarchical clustering is performed using euclidean distance. A continuous factor is displayed (-n -f age argument). Calculates spectratype, that is, histogram of read counts by CDR3 nucleotide length. The spectratype is useful to detect pathological and highly clonal repertoires, as the spectratype of non-expanded T- and B-cells has a symmetric gaussian-like distribution. 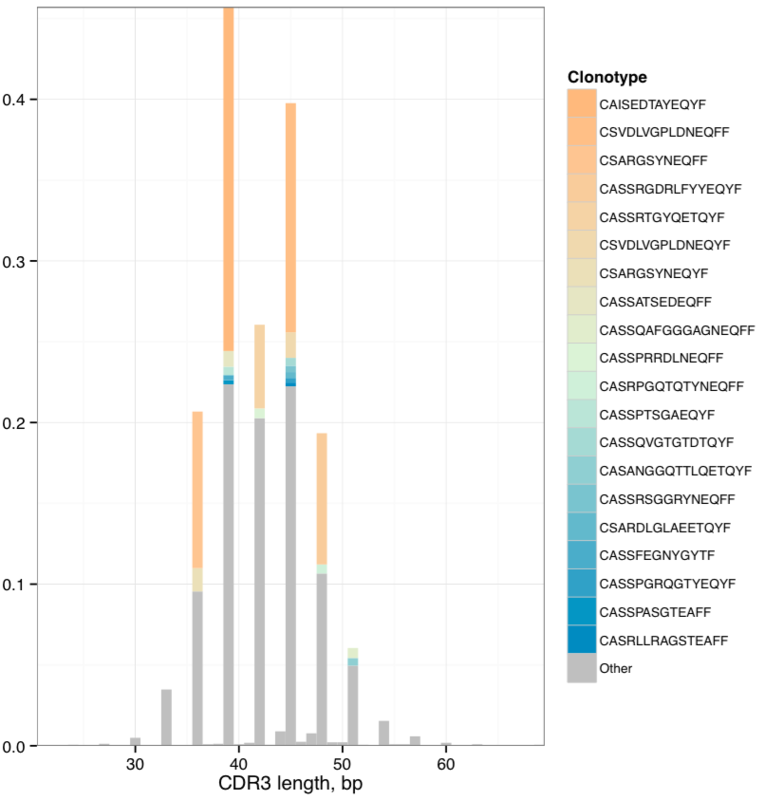 Plots a spectratype that also displays CDR3 lengths for top N clonotypes in a given sample. This plot allows to detect the highly-expanded clonotypes. Spectratype with additional detalization. Most abundant clonotypes are explicitly shown. Plots a circos-style V-J usage plot displaying the frequency of various V-J junctions. A matrix with rows corresponding to different J segments and columns corresponding to different V segments. Each cells contains the frequency of a give V-J junction. The file has .fancyvj. [unwt or wt depending on -u parameter].txt suffix. An image having the same name as the output table, with the exception of .pdf extension, is generated. The plot is built using circlize R package. V-J junction circos plot for a single sample. Arcs correspond to different V and J segments, scaled to their frequency in sample. Ribbons represent V-J pairings and their size is scaled to the pairing frequency (weighted in present case). 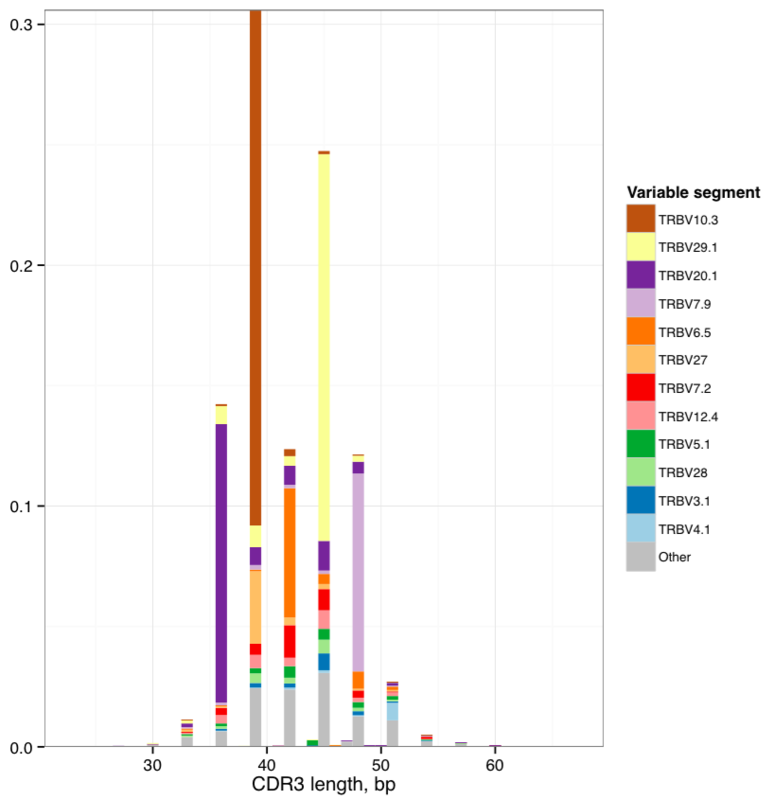 Plots a detailed spectratype containing additional info displays CDR3 length distribution for clonotypes from top N Variable segment families. This plot is useful to detect type 1 and type 2 repertoire biases, that could arise under pathological conditions. Stacked spectratypes by Variable segment for a single sample. Most frequent Variable segments are highlighted.